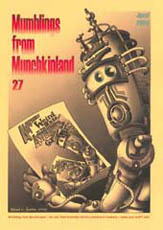 Mumblings from Munchkinland - ZineWiki - the history and culture of zines, independent media and the small press. Contributions of writing have come from Bert Castellari, Roger Dard (Star Rover), Arthur Haddon (Telepath), Joe Haldeman, Justine Larbalestier, Megan Lee, Rex Meyer, Bob Nelson, Tim Nelson, Graham Stone, William Veney, and original, never published fiction from Donald H. Tuck. This page was last modified on 30 April 2013, at 15:46.